This patient had fallen off her bike when she was younger. Her upper front tooth was fractured and required a root canal. 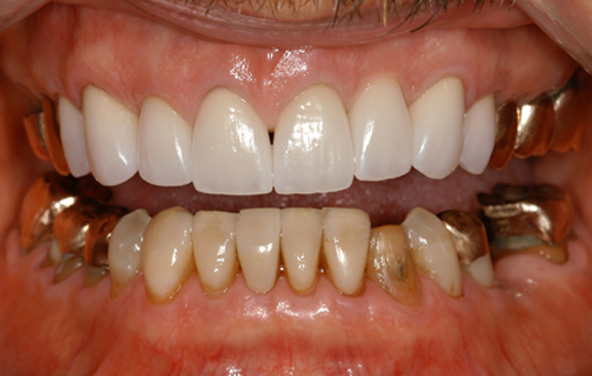 Within a few years after the accident, the tooth began to badly discolor. And now that her braces were off, she wanted a pretty smile. 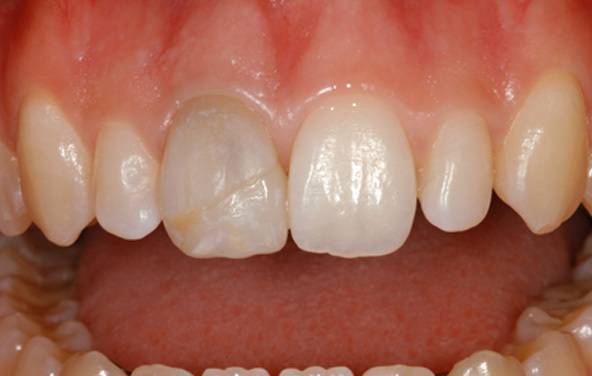 The damaged tooth obviously needed a crown, but the cause of the discoloration was a surprise. We discovered that a previous dentist had left cotton inside the tooth, and discoloration had occurred from bacteria and staining that accumulated inside. 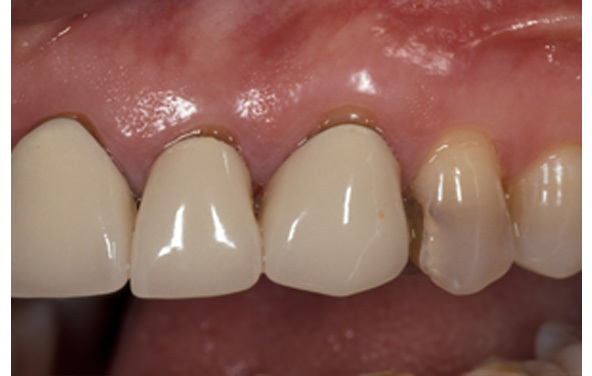 Once the decay was cleaned out and the tooth was restored, it had a very natural appearance. 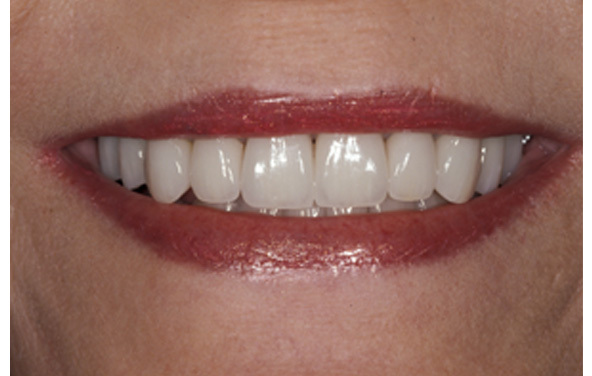 Although she had faithfully gone to a dentist her whole life, this patient did not like her smile. 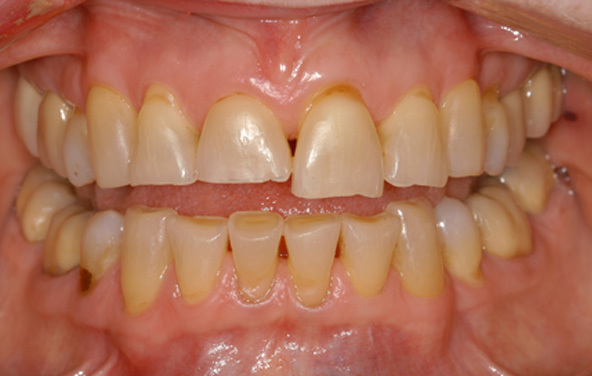 She had undergone periodontal treatment, multiple extractions, orthodontic treatment and many restorations, but her teeth still appeared tired. She wanted them to sparkle. 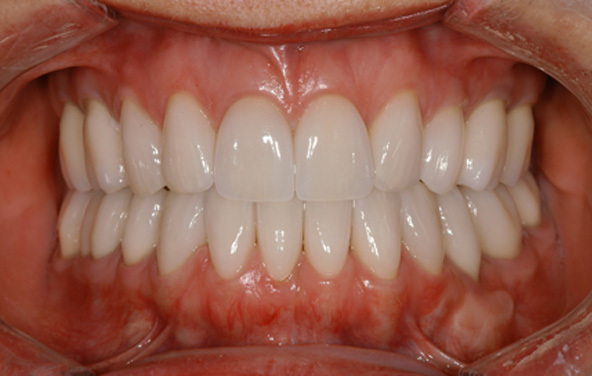 To make a dramatic change, it is sometimes necessary to restore all of the teeth at once. That is what we did here, and the result is magical. Her teeth are white, spaces are filled in and everything matches beautifully. Our patient got her wish: Her new smile sparkles! 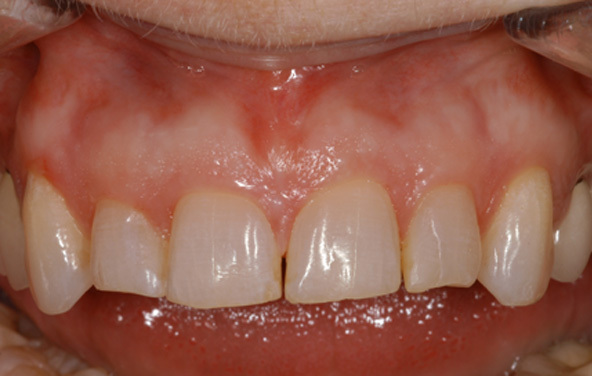 This patient had severely worn her four front teeth as a result of a bad bite. 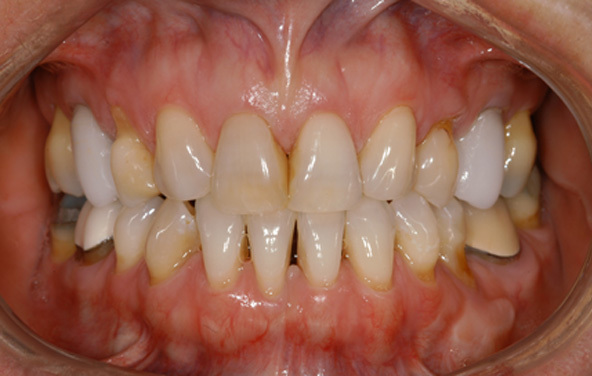 Orthodontic treatment was recently completed to position the teeth properly, but now, she needed to restore the worn teeth to complete her transformation. Porcelain crowns were placed on the upper four front teeth. Their natural translucency, color and form make her look much younger. Inferior dentistry hindered this model's career. 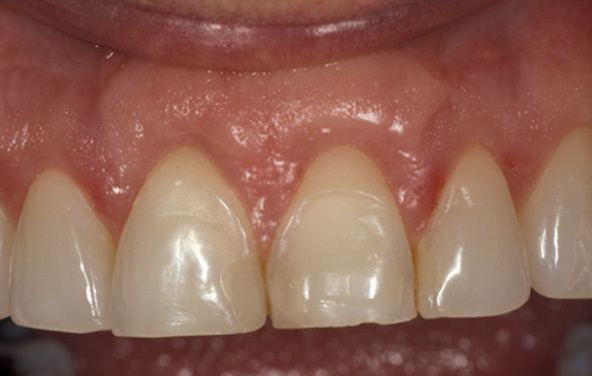 Dull, opaque crowns with visible metal margins needed to be replaced. And, more teeth should be crowned to cover the dark, tetracycline-stained teeth. A full, natural-looking, sparkling smile is ready for the camera. 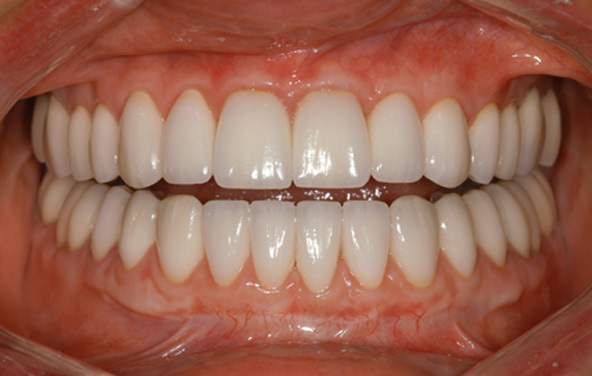 The porcelain crowns cannot be distinguished from real teeth. This patient, a very busy and successful physician, was dissatisfied with his front crowns that were recently placed by another dentist. His stressful career had contributed to his habit of clenching and grinding, as evidenced by worn teeth and failing restorations. The new crowns were uncomfortable to his bite, and he had several complaints about their form. The solution required a comprehensive approach. 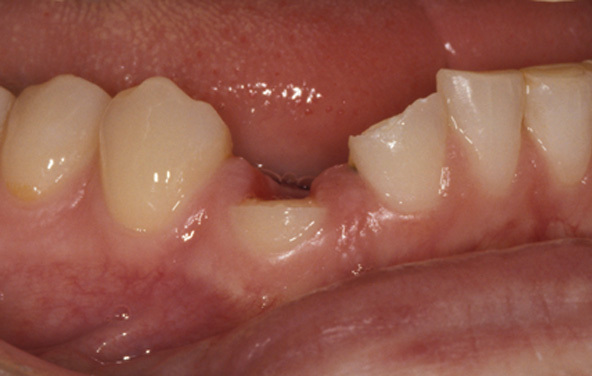 In order to make the teeth feel more comfortable, it is sometimes necessary to rebuild the bite entirely. 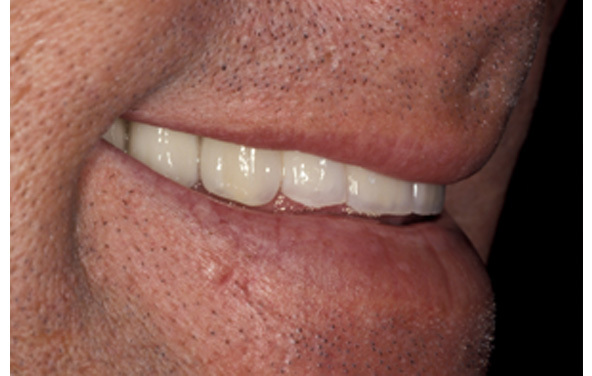 By restoring all of the teeth, we were able to create a handsome, more youthful smile and achieve a more comfortable bite. A gummy smile with teeth that appeared too short. All teeth had yellowed and were badly worn. 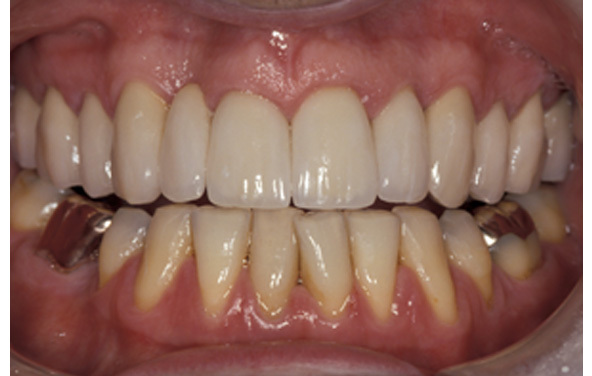 Periodontal disease had weakened the support of all teeth, causing some to be unsalvageable. A beautiful and healthy smile was achieved. 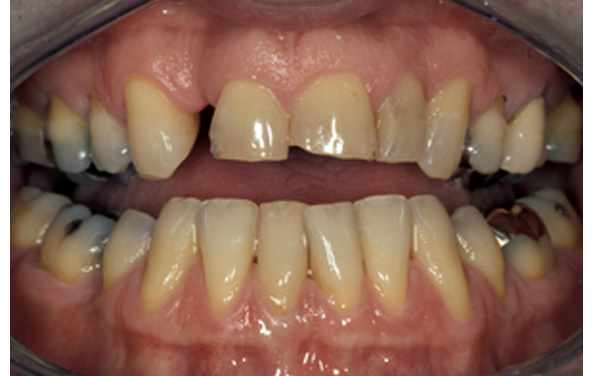 Periodontal surgery improved the periodontal health and eliminated the gummy smile. Implants replaced the missing teeth. 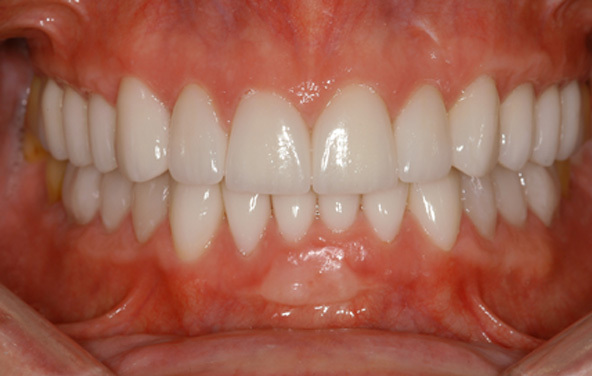 All teeth and implants were restored using individual porcelain crowns. People often thought he had no upper teeth. His upper teeth did not show when he smiled. 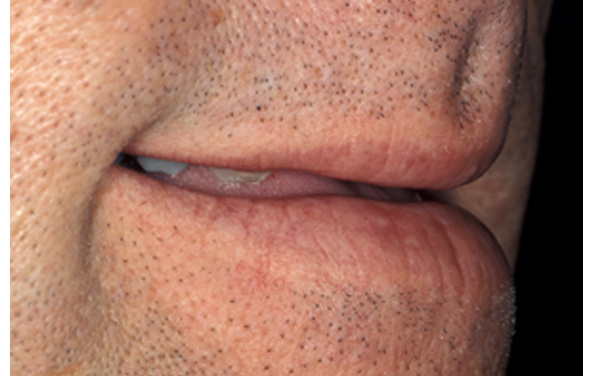 Ideal treatment for his underbite and wear would have included jaw surgeries and years of braces. Personal life changes caused him to seek a more immediate solution. 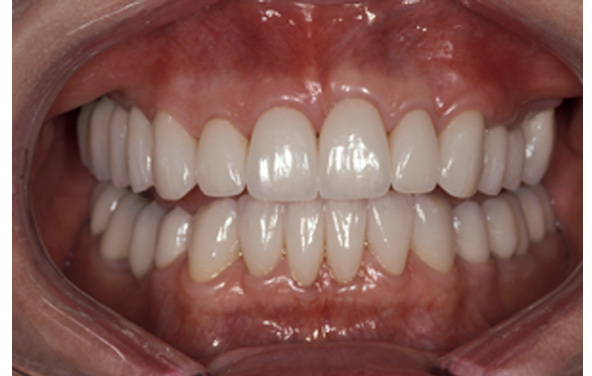 By shortening the lower front teeth and using crowns to lengthen all upper teeth, a dramatic result was achieved. 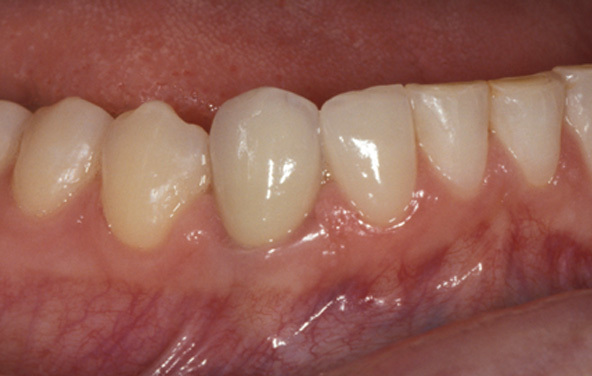 After thoroughly preplanning this case, the actual treatment required only two appointments. 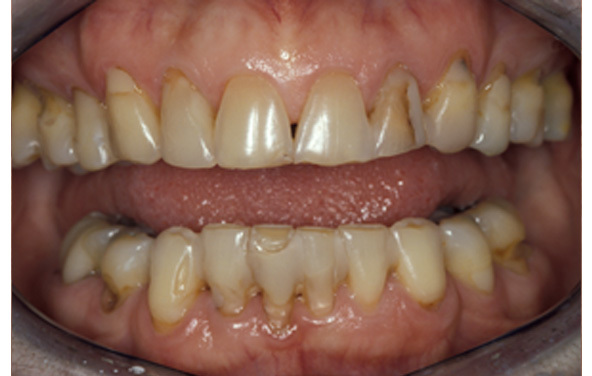 Smoking and periodontal disease deteriorated this celebrity's smile. 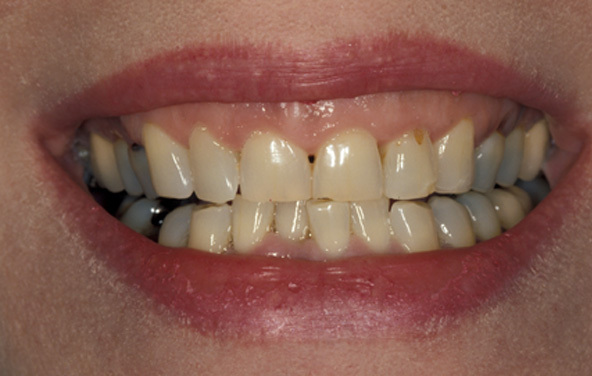 Her natural teeth and restorations had become stained and discolored. 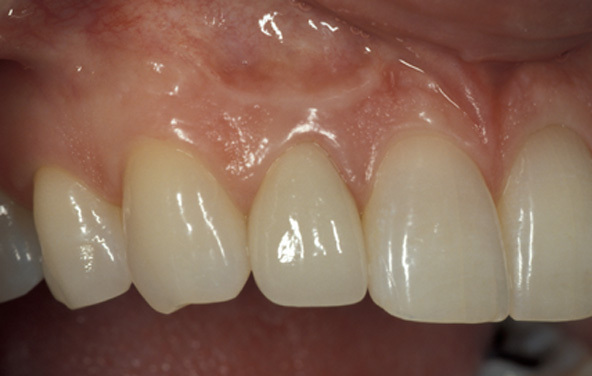 Receding gums had exposed metal margins of old restorations and spaces between her teeth. Her beautiful, youthful smile was restored. Our patient provided earlier photographs, which were used as a guide. Porcelain crowns filled the spaces between her teeth, eliminating the shadows. And, porcelain margins will never show the dark lines of metal margins. 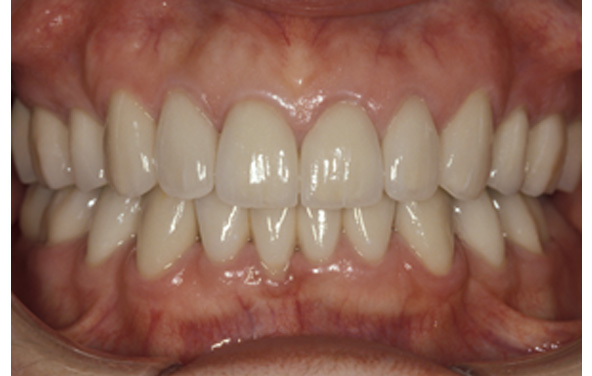 This patient did not like her smile and felt that it was a hindrance to her career. Her teeth were discolored, most were badly worn, and her gum line had receded. 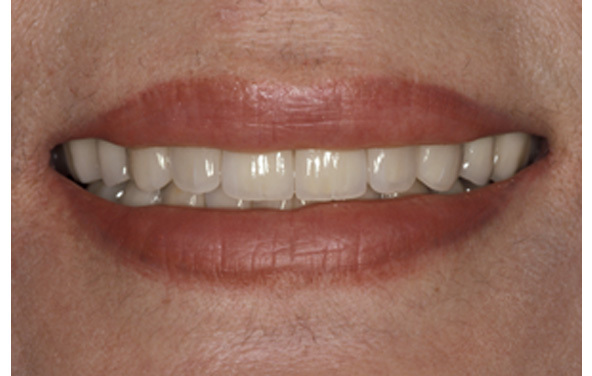 A beautiful cosmetic result was achieved using porcelain crowns. 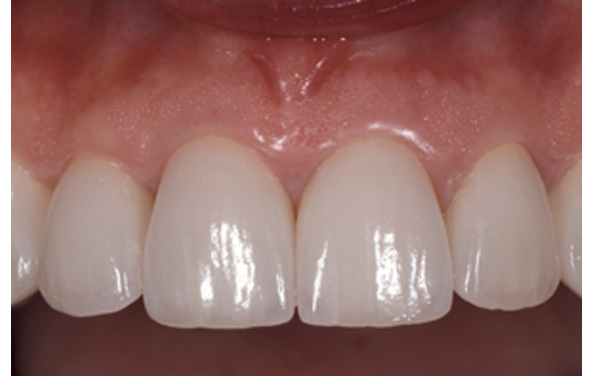 The porcelain crowns produced a whiter color and provided better form and contours to the teeth. This patient suffered from years of TMJ (temporomandibular joint) symptoms. Contributing factors were her clenching and grinding habits, bad bite and severe wear of her teeth. She wanted to stop the pain and have a comfortable bite and pretty smile. 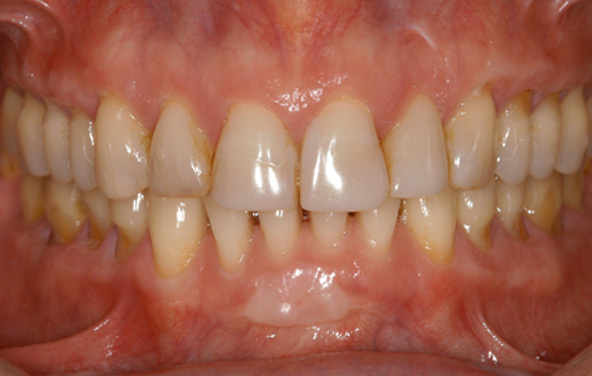 First, orthodontic treatment was necessary to move the teeth into their correct positions. 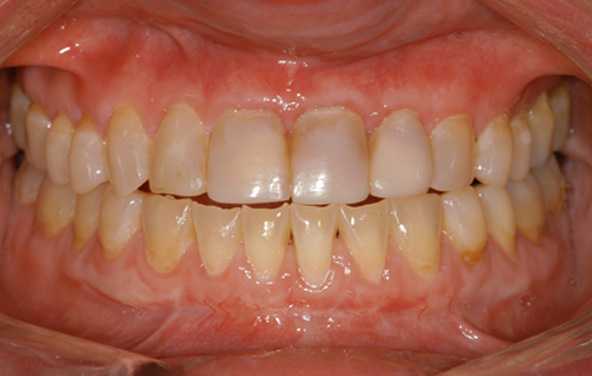 Then, porcelain restorations were used to rebuild her bite and create a beautiful smile. All her goals were accomplished. She now wears a night guard to ensure that any grinding in her sleep will not harm her restorations or aggravate her TMJ. 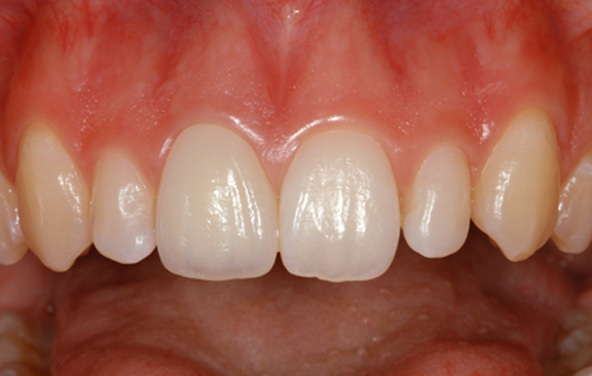 This patient's front teeth were injured in a serious accident. Having completed orthodontic treatment and root canals, they were ready for restorations. The beauty and function of her smile were renewed. 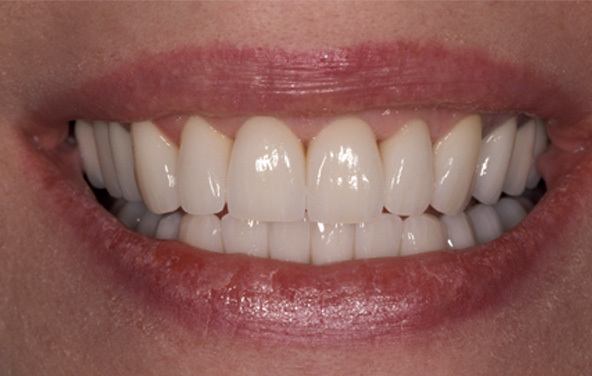 Porcelain crowns restored the lighter color and more natural contours of her front teeth, creating a smile even better than it was before the accident. Appearance and function were both important issues. 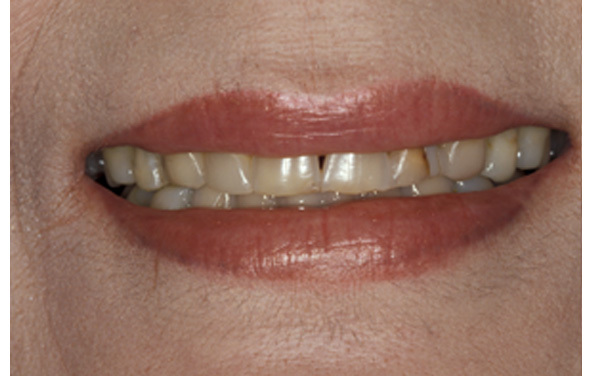 Motivated by cosmetics, this patient also had many functional problems with her teeth. Cavities and falling restorations were present, and a grinding habit had caused her teeth to become worn, chipped and loose. She now has the smile of her dreams. 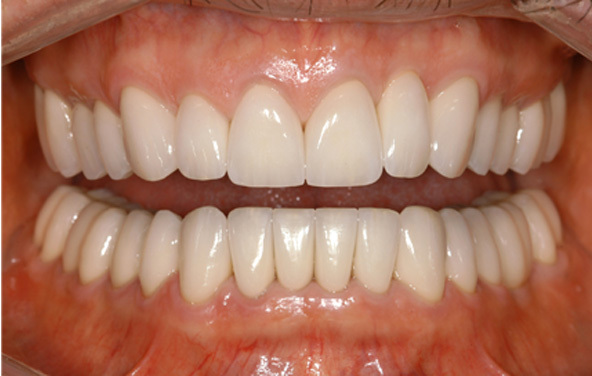 All teeth were restored using metal-ceramic crowns (the strongest ceramic restorations available). 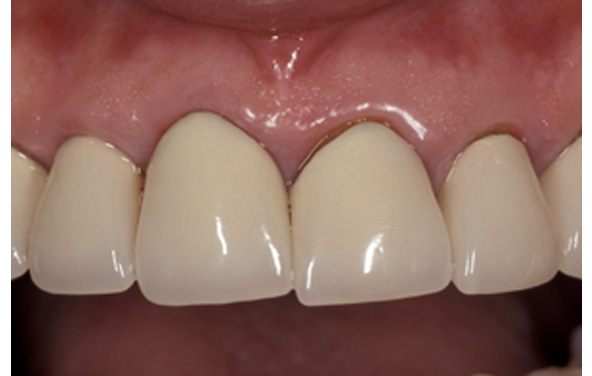 Crowns on weak teeth were splinted together to provide stability and support. Porcelain margins avoided metal shadows at the gum lines. Certain medical conditions (such as acid reflux or bulimia) can allow stomach acids to destroy perfectly healthy teeth. Highly concentrated acids from the stomach literally dissolve the minerals from the teeth, causing sensitivity, discoloration, erosion and wear, and can lead to self-esteem issues. 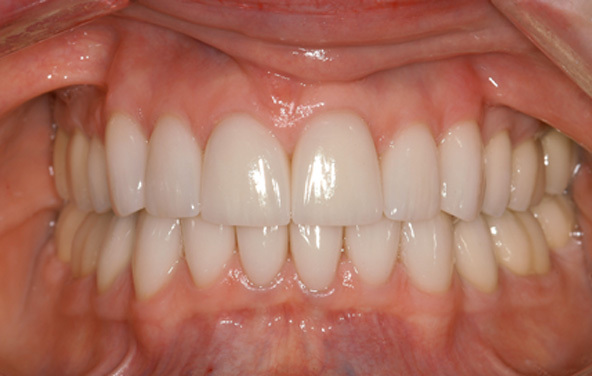 Porcelain crowns literally revitalize teeth that have been damaged from wear or acid. The bite is improved, sensitivity diminishes, and form and color are like new. An accident disfigured the appearance of this patient's smile. 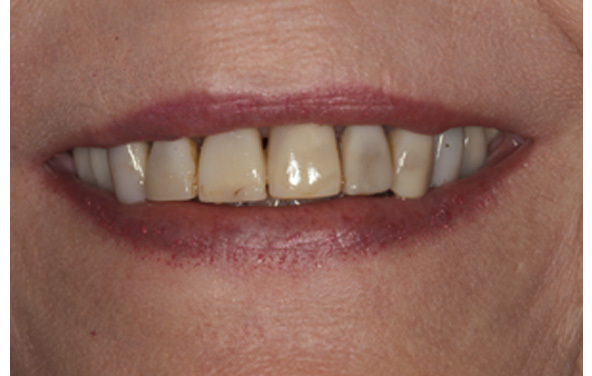 She had broken an incisor in a fall and needed the tooth repaired to restore her smile. Her smile is whole again. 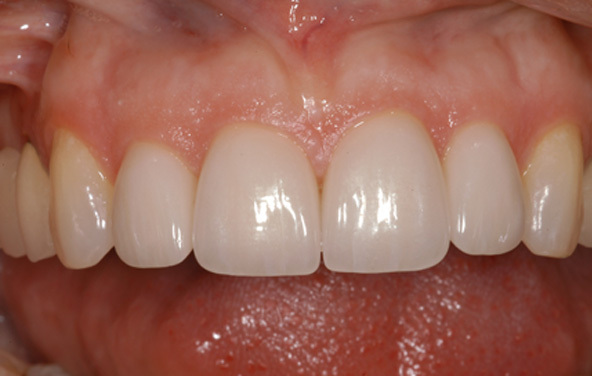 A new porcelain crown created a repair that is virtually undetectable. News flash: Hockey can be bad for your smile. 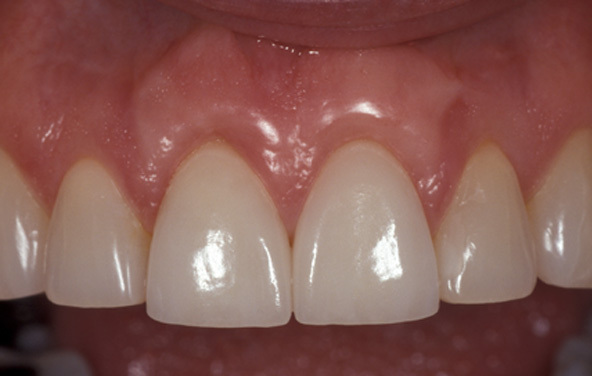 A "high stick" fractured two lower teeth, and the angular fracture of the cuspid extended beneath the gum and bone. Many clinicians would have recommended extraction. But, we chose to save this tooth through a combination of orthodontic, periodontal and restorative dental treatment. 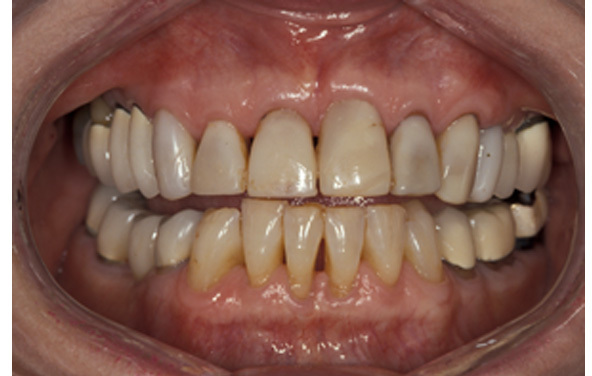 A combination of treatments saved this tooth and restored this smile. 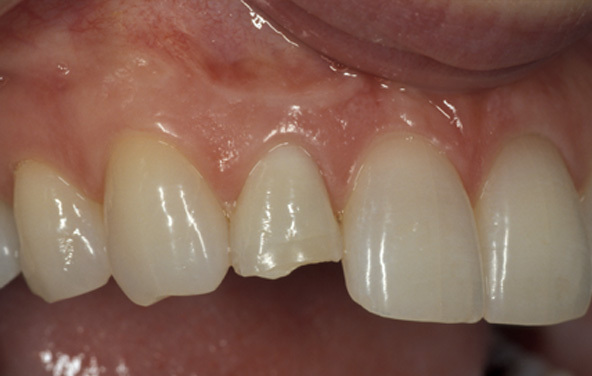 Following a root canal, the broken fragment of the original tooth was bonded into place. This allowed the orthodontist to move the tooth upward. Periodontal surgery then evened the gum line. 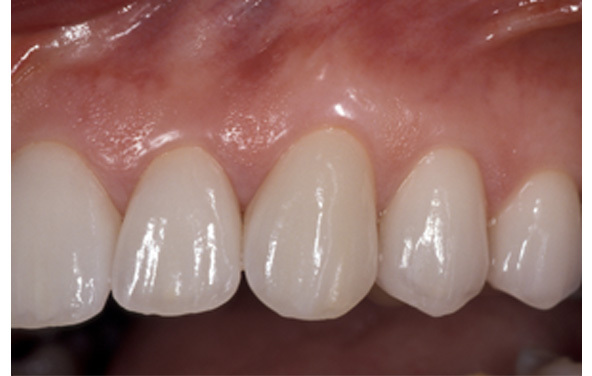 Finally, a crown and veneer restored its original look, feel and function.